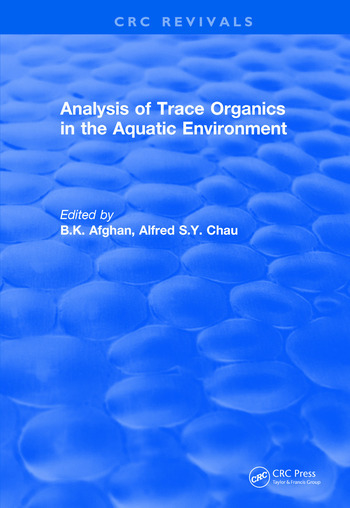 A supplement to previous books edited by Afgan and Chau, this publication covers the practical aspects of analytical methodology for trace organics. The book reviews the published work on the occurance, distribution, fate, effect, and environmental impact of specific classes of compounds. Essential background information emphasizing practical aspects of various methods with respect to advantages and disadvantages of the published methods is also discussed. Analysis of Volatile Halogenated and Purgeable Organics. Polychlorinated Biphenyls. Analysis of Toxaphene in Environmental Samples. Environmental Aspects and Analysis of Phenols in the Aquatic Environment. Analysis of Chlorinated Dibenzo-p-Dioxins and Dibenzofurans in the Environment. Analysis of Polycyclic Aromatic Hydrocarbons in Environmental Samples. Phthalate Esters in the Aquatic Environment. Organometallic Compounds in the Aquatic Environment. Humic Acid and Related Substances in the Environment. Index. B.K. Afghan and Alfred S.Y. Chau.